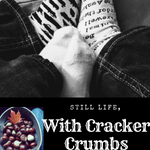 My Sunday-Monday Post | Still Life, With Cracker Crumbs..
Last week was a big week of chores. Lol. Don’t we all have those weeks where it is like you have a million different family business or work related tasks to take care of? That was my week, just TCB. Thursday was supposed to be book club night, but our hostess Mary got sick and had to cancel so a few of us went out for drinks instead. Then Friday night we had an impromptu get-together with my little brother and his family, where we got a few pizzas, and then took the kids out to the backyard where we tried to call screech owls. It was pretty funny, my niece L. was racing around asking where is the owl , while Wyatt was doing his best imitations of the screech owl call. Neither of them, at three years old, were very good at the being quiet and listening part yet. It was a really good moment, although a bit chilly one. I loved revisiting this island and it’s inhabitants! This was a great book. And luckily for me, while I was reading it, the next book in the series came in! Riverdale, Great British Bake Off reruns, HGTV , Midnight Texas – and I am about to start watching all the Christmas movies that I can! I have loved reading a couple of Colgan’s books, so I want to read these latest ones. They are so good! I almost finished with Christmas on the Island – I am eating it up! Lol. Yay for Christmas shows! We just watched White Christmas the other day which is something of a tradition over here now, I guess. And I watched the latest Riverdale last night- that show lol. That is one of our favorites! I used to watch it with my mom every year growing up, now we watch it here every year. It is a true classic. I like that you had a plan B for book club night. I had actually put makeup on for the first time in a month, so staying home was not an option! Lol. The antidote to a busy week of chores is cuddling with your son and a book at night. He certainly is growing up quickly! I like the looks of those Colgan books. Have a wonderful, less stressful week ahead. Colgan is my new favorite go to read author. I started reading her and couldn’t stop. It’s interesting to see which of my old favorites my son enjoys – he liked Emmet Otter but not Mickey’s Christmas! Lol. I really liked the books too! Are you caught up on the show? I am so confused by some of the choices happening the past two weeks. I still like it, but where is everyone going? Lol. Not yet – I think we’ve only watched one or two episodes of the new season so far. Oh no, that doesn’t sound good. Hopefully it’ll all make sense soon. I need to convince my husband to stop watching reruns of Impractical Jokers on Saturday so we can get caught up. Sounds like a great week! Come see my week here. Happy reading! I looked at some of the books I put on hold and most are Colgan’s..I seem to be about to have a very Colgan Christmas…lol. I’m watching Christmas stuff, too! It sounds like you had a busy week. I also had a lot of meetings and time spent with other people. I was completely exhausted by the end of it. I need my books and quiet time. Ah what a lovely family memory that sounds like. Cute! Happy reading & a wonderful week to you and your family.